Excerpt, “The German Novelists: Tales Selected From Ancient and Modern Authors in That Language: From the Earliest Period Down to the Close of the Eighteenth Century. Translated from the Originals: With Critical and Biographical Notices.” Editor, Thomas Roscoe. In Four Volumes. 1826. It is related by Hondorff (in his Theat. Hist.) that in the year 1272, a certain necromancer who arrived at Creusnach from the Netherlands, one day in the open market place struck off his page’s head, and after leaving the body for the space of half an hour upon the ground he again united it to the trunk. 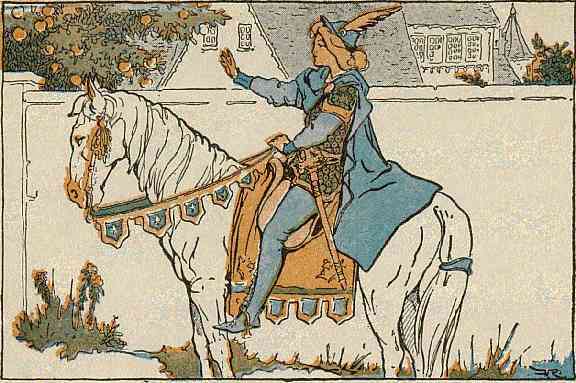 The page then riding with his dogs into the air, gave the huntsman’s cry, and rode about as if engaged in the chase. A similar exhibition in the clouds was displayed by Doctor Faustus to the Italian Ambassadors; and is likewise said to have been in the power of J. Scotus of Frankfort, of Zoroaster, and of Robert of Normany (Görres Deutschen Volksbücher). Far around this castle, among the mountains of the Hartz and in the Thuringian forests, appears the Wild Hunter of Hackelnberg. His favorite haunts, however, are in Hackel, from which he derives his name, and more particularly in the district of Dumburg. He is often heard at midnight, as he drives through storm and rain, or in the dim moonshine, when the heavens are overcast. With his swart hounds, he chases through the clouds the shadows of wild animals he once destroyed. Most frequently the chase goes over Dumburg, straight athwart the Hackel towards the now ruined villages of Ammendorf – upon the limits of the village of Hakeborn, not far from the little town of Egeln. He has never been seen except by a few Sabbath-born children. Sometimes he meets them as a solitary hunter with a single dog; at others borne in a chariot with four horses, attended by six large hounds. 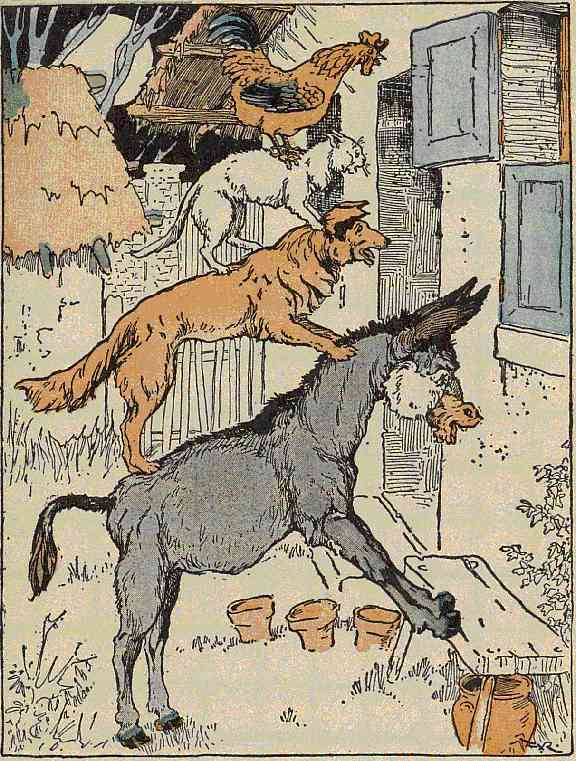 All, however, may hear his fierce progress through the rushing air, the hoarse cry of his dogs, and the tramp of his steeds, as if dashing through the moor waters, and often, too, his wild hu! hu! as he speeds along, preceded by his guide, the large horned owl, with her solitary whoop. There were once three travelers who had sat down to refresh themselves, not far from Dumburg. The night was gathering fast, the moon shone fitfully through the fleeing clouds, and all was silent around as the tomb. Suddenly was heard a rushing like a strong current. They looked up, and a great horned owl flew over them. The travelers lay down among the bushes. Loud rushing of the hounds, as if tramping down the grass, and high above them in the air the stifled cry of hard-pressed beasts; mingled from time to time with the fierce sound of the hunter’s hu! hu! Two of the travelers pressed closer to the ground; the third could not resist. 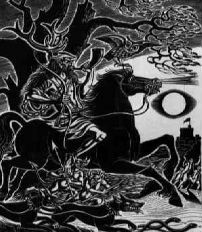 Glancing through the bush, he saw the shade of the Dark Hunter, urging on his dogs, as his horses galloped by. “In one of the convents at Thuringen, there once resided a nun of the name of Ursel. This creature being of a violent temper, beat the sisterhood, and often interrupted their hymns with her harsh sharp voice; so that they soon gave her the nickname of Tut, or Stut Ursel. But they bitterly repented having done this after her death. For always, after eleven o’clock at night, she appeared in the shape of a screech owl, and thrush her head into the choir of the church, destroying the harmony of their hymns with her harsh tones, stammering worse than before. The same occurred in the morning at four o’clock, as she never failed to join in their choral songs. “With trembling limbs the sisterhood supported this situation for a few days; but on her fourteenth visit one of the nuns whispered in great alarm. “Now I am sure it is the Ursel!” The hymn ceased, a sudden terror seized on all; their hair bristled, the colour forsook their lips, and they all ran out of the church during service, shrieking. “It is the Ursel, the Tut Ursel!” and no threats or persuasions could induce them again to enter it, until the persecuting spirit of Ursel was banished from the convent walls. One of the most celebrated exorcists of his time was sent for from the borders of the Danube. Belonging to an order of Capuchins, and by dint of fast and prayer, he succeeded in expelling Ursel — in the shape of a great horned owl — and driving her among the ruins of Dumburg. “At that time, the Wild Hunter was passing over Hackelnberg. Hearing the hu! hu! of the great horned owl as he drove along, he found it so well adapted to his own cheer for his hounds and horses, that he entreated to have her company in the chase; and they were never afterwards separated. It is most probable that some great hunter who rode in the Middle Ages gave occasion to the preceding tradition, belonging likewise to the family of the nobles of Hackelnberg or Hackelberg. The last distinguished Nimrod of his race was Hans Von Hackelnberg, who ended his days in an hospital, during the sixteenth century, at a place not far from Hornberg, which lies on the borders of the Duchy of Brunswick. Upon his grave-stone in the church-yard, of that place, is engraved the figure of a full equipped knight, mounted upon a mule. Travelers passing through Wulperode, used to stop to admire the heavy armour of Hans there exhibited to view. But the helm alone now remains; the rest of his accoutrements having been transferred to Deersheim. In regard to the strange manner of his death, the following tradition has obtained currency; and this, as being historically connected with the foregoing, may here be added. Hans von Hackelnberg, the ducal master of the forests in Brunswick, appeared to live only for the chase. 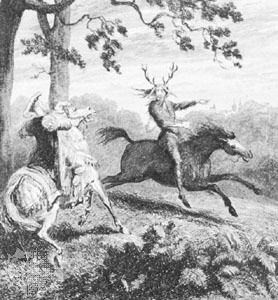 In order to indulge this propensity, he bought or hired a number of neighboring chases, and devoted the whole of his time to the hunt; traversing with his followers and his large stag hounds all the fields, forests and mountainous districts round the Hartz; year after year, both by day and night. He once passed the night in Hartzburg; and there he dreamed that he saw a terrific wild boar, which he attacked, and after a long struggle he fancied that he was overcome. As he waked, the dreadful apparition seemed still to haunt him; he could in no way vanquish its impression, though he was the first to laugh at the occurrence. Wandering a few days afterwards among the Lower Hartz, he encountered an immense boar, the exact image of that he had beheld in his sleep; in colour, in size, and in the length and strength of his tusks. But Hans knew no fear, and was the first to begin the battle, which was equally ferocious, crafty, and unyielding on both sides. It long remained undecided; only by employing his utmost dexterity and courage, when nearly reduced to the last extremity, that Hackelnberg finally succeeded in laying his enemy low. Long he gazed upon his savage foe as he lay dead at his feet; then stomping upon his head with all his force. “Thou hast not, and thou shalt not tear me, as thou tore me in my dream!” Such was the violence with which he struck him, that one of the sharp tusks pierced his boot, and wounded him in the foot. At first he thought little of the wound; until late at night, continued the chase. However, for want of proper care, his wound worsened, compelling him to hasten towards Wolfenbüttel. Only with utmost difficulty did he reach the hospital at Wulperode; and, shortly after his arrival, died. POPULAR TRADITIONS Collected and Narrated by Otmar, from “Folks-sagen” – by Nacherzhählt Von Otmar. Among those modern German writers, so justly eulogized by Madame de Staël for their anxiety in investigating and preserving the literary reliques of their country, we shall first touch upon the labors of Otmar. These it would appear were some of the earliest instituted during the last century, which afforded an example for researches of a similar kind. 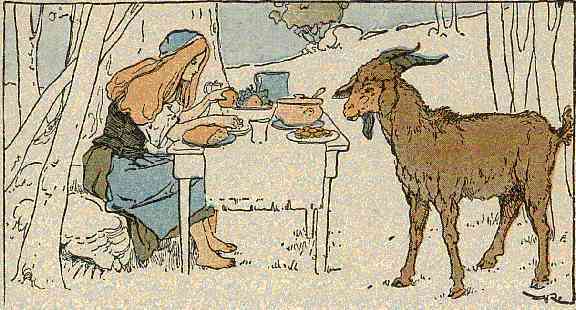 They were speedily followed by other efforts of congenial spirits, whose veneration for their national literature and antiquities has rendered their names so popular at the present period; by those of Gottschalck, of Büsching, and of the Brothers Grimm. In the collections of the latter authors, frequent reference occurs to the stories contained in the work of Otmar, who as a foremost gleaner in this wide and fertile field, has enriched his pages with some of the boldest and most characteristic features of the “Olden Times.” Several of them, indeed, have been borrowed and imitated by succeeding writers; but all present us with subjects of a very striking and diversified class – convivial, chivalric, terrific, and amusing. Specimens of all of these are to be met with in the following selections. In truth, no collection of popular stories better deserves to form the ground-work of a succession of national traditions and tales, such as is here proposed, embracing, as it does, a space of four centuries (from 1200 to 1600) and, for the most part, boasting the merit of oral and local communication, received upon and referred to the peculiar traditionary site, by the relater’s own industry and perseverance. “The popular stories here offered to my countrymen,” observes the collector, “are not the effusions of fancy, not mere historic remnants of the manners of the Middle Ages adapted to garnish a modern romance, often founded only upon some current tradition of little worth. They are real tales of the people, collected among them with much care, as they were fast dropping into oblivion, and are here narrated in the most simple and faithful language. “Simple and unimportant as the subject may at first appear, it will be found upon a nearer view, well worth the attention of philosophical and historical inquirers. All genuine popular tales, arranged with local and national reference, cannot fail to throw light upon contemporary events in history, upon the progressive cultivation of society, and upon the prevailing modes of thinking in every age. Though not consisting of a recital of bare fact, they are in most instances founded upon fact, and in so far connected with history, which occasionally indeed borrows from, and as often reflects light upon, these familiar annals – these more private and interesting casualties of human life. Their poetical origin, frequently a corruption of the old ballad, does not impugn their veracity; inasmuch as the earliest history and the laws of nations themselves are known to have been first recorded in poetry. Hence heroic poems, the earliest annals of a country’s glory, will be found the most frequent store-house of the national tale and the ballad; the Iliad, the Edda, and the Niebelungen, having equally given birth to prose fiction founded upon facts borrowed from poetry and infinitely diversified. “The popular tale, may, therefore, be most aptly illustrated by terming it the memory of some event preserved in its contemporary character and ideas, though divested of its native poetical ornaments. In this form, its earliest origin and ramifications in different countries, growing gradually more obscure, it again furnishes materials for the poet or the historian, as appears sufficiently evident from Greek and Roman history, no less from their mythological outset, than from scenes and events recorded by their subsequent historians, by Thucydides and by Livy. “It is thus that popular tradition, connected with all that is most interesting in human history and human action, upon a national scale, a mirror reflecting the people’s past worth and wisdom, invariably possesses so deep a hold upon its affections, and offers so many instructive hints to the man of the world, to the statesman, the citizen and the peasant. “The voice of the people is heard in deep and earnest discourse; its peculiar features and disposition are strongly marked; here it is dissolved in unaffected tenderness, there it rises into ferocity or borders upon despair. Sometimes it accosts us in joyous and playful tones, at others it is bitter and satirical; now it bursts like a torrent against its feudal oppressors, and again subsides into servility, wretchedness and craft. Often it groans under the united weight of superstition and of chains; again looks out on nature, with a more clear and cheerful eye, presenting us with congenial pictures of rural festivity and repose. “Signs of approaching changes, no less in manner than in states, may likewise be traced, floating down this popular current of opinions, fertilizing the seeds scattered by a past generation, and marking by its ebbs and flows the state of the political atmosphere, and the distant gathering of the storm. “National traditions farther serve to throw light upon ancient and modern mythology, and in many instances they are known to preserve traces of their fabulous descent, as will clearly appear in some of the following selections. It is the same with those of all nations, whether of eastern or western origin; Greek, Scythian, or Kamtschatkan. And hence among every people just emerged out of a state of barbarism, the same causes lead to the production of similar compositions, and a chain of connection is thus established between the fables of different nations, only varied by clime and custom, sufficient to prove not merely a degree of harmony, but secret interchanges and communications. “And though it be impossible to trace their course, it is certain that a variety of popular sayings and traditions early spread over different countries, where they became naturalized, and have been considered as national for centuries. Others, which are purely so, have on the other hand, been confined to a narrower sphere, and are generally of an inferior character, failing as it were in the strength of pinion, to soar beyond their native boundaries, boasting less of that mercurial spirit which gives wings to more golden thoughts. The choicest production, indeed, may thus be said to become the property of various nations; they travel far, everywhere claim a home, and seem to lose their origin in the mists of antiquity. 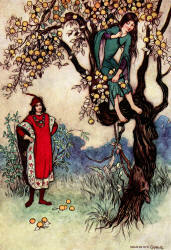 “Not so, however, with the more local spiritual world of water-fairies, of dwarfs, of wild hunters, and of were-wolves* with a long appalling list of robber-knights, who cast more gigantic shadows as their sun went down; all of whom, as if spell-bound, continue to haunt the nature spots and solitary places assigned to them by immemorial tradition. *A peculiar, but well-known species of wolf, in Germany (and elsewhere) which assumes the human shape, in order to gain access and prey upon the fold. Verbi gratia – the modern priesthood of France and Spain. Ed. These, though not abstractedly the most excellent, are some of the most favorite and valuable traditions belonging to Germany. They do not, indeed, like others, tend to illustrate the history and migrations of different people, they disturb not the caverned slumbers of the great Barbarossa, nor consecrate Charlemagne’s holy crusades against the Saxons. They are the peculiar heritage of certain districts; they exhibit many beneficient and even humourous traits; their agency is for good as well as for evil; and in so far they differ from the sterner character of the old northern legends, and from other branches of the Scandinavian, Danish, Scotch, and Irish, all of whose invisible agents are gifted with little benevolence and less mirth. Their appearance almost invariably announces fatal events; they have all a funereal aspect; they come to alarm and prepare us; and they are all seen by a species of second sight that bodes no body any good. They are not half allied to us like the German dwarfs and fairies, or the still more sociable house goblins; they are not even like Shakespeare’s and Milton’s more fanciful world of spirits; but dim disembodied essences whose proportion we cannot measure; real ghosts, demons, giants, sorcerers, and ugly drawfs, who surprise us among hills of mist, or beside the solitary tarn where the water-spirit crouches in wait for her prey. “Thus,” as it is justly observed by the writer before us, “popular traditions take their color from the aspect and character of the country. Amidst deep dark woods, impervious to the sun’s rays, upon solitary heaths, and wild waste marshes, whose floating mists darken the face of the sky, and cast a gloom over the eye and over the soul, must we not expect to find the pictures there delineated alike stern and mournful? So the secret caverns, the dizzy precipices, and the frowning ruins of the robber castles, fill the minds of the neighbouring people with wonder and with awe. For here were the dread mysterious oracles heard of old, at whose voice a temple of human bones rose, for a sacrifice, into the air, and priests hastened to immolate thousands of their brethren, as their gods thirsted afresh for their victims’ blood. 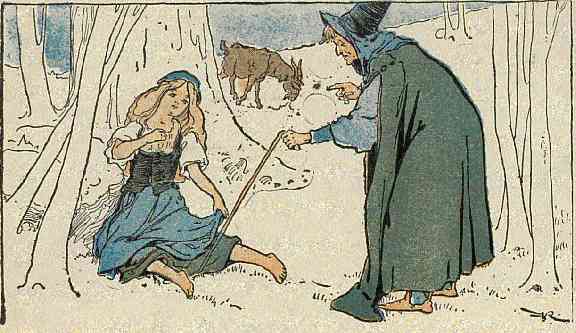 “What must be the character of a people’s traditions, whose earliest festivals consisted in violence and bloodshed; whose succeeding centuries passed in a series of mutual wrongs and oppressions, continued down to a period when their children, yet alive, recollect the accounts given by their grandsires, of fierce wolves and bears entering the houses and tearing the mother, or the babe from the mother’s arms; or of the descent of the robbers from their mountain castle! “What a contrast here offers itself to the rich sunny sky, well-peopled cities, and fertile fields; streams and groves and gardens, fit residence for the gods! Here, a joyful feeling communicates itself, as if for breathing through the heavens, air and earth; and must not such a clime give birth to pictures of human nature, of natural agencies and natural scenery, of like fervid and animated colors? Will not gladness and happy fancies and good humor mingle largely with the favorite traditions of such a country, and are not such the fictions of Italy? And no where is this variation in the tone and coloring of ancient traditions more observable than in Germany.